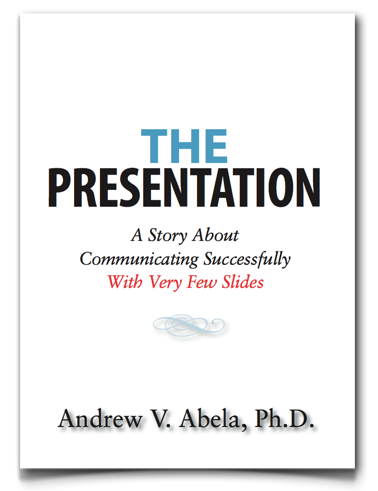 Last night I read Andrew Abela's recently released e-book The Presentation: A Story About Communicating Successfully With Very Few Slides. Abela is a presentation guru (and friend of Juice) who travels the country fighting the good fight against "Death by PowerPoint." His focus is a little different than the Nancy Duarte (Slide:ology) and Garr Reynolds (Presentation Zen) who focus on conveying a message with images and minimal text. While that style has a place for "Ballroom Presentations", Abela sees a need for a different type of presentation for "Conference room Presentations." "they have extensive—but always relevant—detail; they are printed, not projected; and every slide must pass the squint test.”"
The story also outlines one of his core presentation principles, the SCoRE method, which involves repeating a pattern of Complication, Resolution, and Example. It is a story-telling technique that builds audience buy-in as you go along. Abela has taken his own advice by persuading his audience using a compelling story filled with complications, resolutions, and examples. I really recommend this entertaining, quick read as a great refresher for the core concepts of his Extreme Presentation method. You can sign-up for Abela's mailing list and to receive a free copy.